A couple in Las Vegas have been surprised with a free cruise on the new Carnival Panorama which is joining the fleet this December. 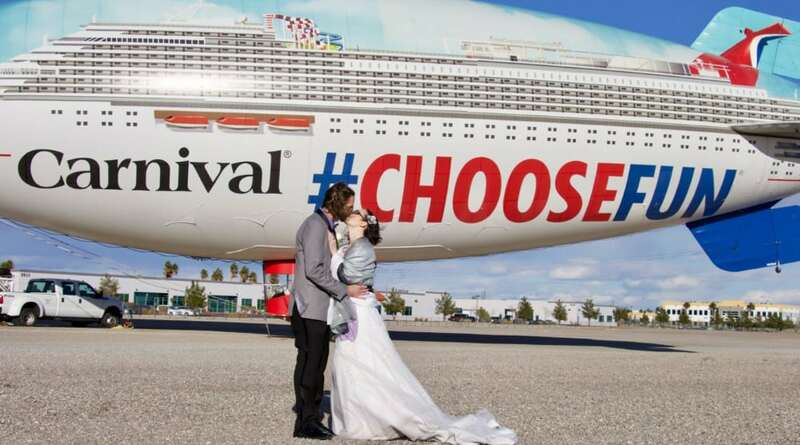 A couple in Las Vegas had an extra special wedding thanks to the Carnival Airship which attended. The 128-foot long blimp hosted the wedding for Amanda Robertson, 32, and Jason Gerken, 37, from Las Vegas. Now this is a dream wedding ceremony for loyal Carnival cruisers! Their one of a kind wedding ceremony was also attended by close family members and friends and of course, the one and only “Elvis Presley” who sang “Can’t Help Falling in Love” as Amanda walked down the aisle. Their honeymoon will be spent on Carnival’s newest cruise ship when she arrives on the U.S. west coast in December 2019. Their three children will also be along for a cruise of a lifetime. The Carnival Airship was in Las Vegas as part of an extended tour of Nevada and Arizona. The Carnival blimp recently completed a month-long tour of California as part of the cruise line’s “ChooseFun” promotion. You read more about that right here. A sweepstake is also being run with a chance to win a free cruise and other prizes for anyone taking a photo of the Carnival airship and then posting on social media with the hashtag ChooseFun. Carnival Panorama will be the third Vista-class ship and is currently under construction in Italy. The ship will sail year-round Mexican Riviera itineraries from Long Beach, California.